You are here: Home / Health & Wellness / Pickleball and the Olympian Sandal — Are You Up for the 100,000 Step Pickleball Challenge? 24 hours. 100,000 steps. Almost 50 miles — virtually a double-marathon. Are you up for the challenge of amassing 100,000 steps in a single day simply by playing pickleball? It will surely test your limits — both physically and mentally. It seems like a daunting task. Afterall, 10,000 daily steps — a lofty goal in and of itself — is considered the magic number to hit to be considered “healthy” and successfully getting one’s recommended daily exercise. But ten times that number? 100,000 steps in a single day? Is it insanity? Or a challenge worth accepting? Earlier this year, our local pickleball club hosted a 24-hour pickleball marathon fundraiser in which all proceeds from the fundraiser went towards the cost of a splash pad to be added to Elley’s Hope Playground Park — a 15,000 square foot ADA-equipped playground situated adjacent to our courts. So, beginning at 12:00 AM and ending precisely 24 hours later at 12:00 AM, at least one pickleball court was being played on (by somebody) at all hours during this 24-hour time period. (Incidentally, 91 people were part of the challenge and $2200 was raised). What about an Individual Marathon/Challenge? I admit, that’s pretty impressive — pickleball being played on at least one court for 24 straight hours. As I further considered the feat, however, it didn’t seem like that big of a deal given the fact that amongst 91 people we all took shifts to cover the 24 hours. As a kid, I remember doing a couple different 24-hour marathons. However, each of these marathons required each participant to participate individually for 24 consecutive hours — through sleep deprivation, boredom and total exhaustion. So, to tweak the “terms” for our next 24-hour challenge, I was thinking that, instead of having 24 different groups of four take 1-hour shifts playing throughout the day, it would be more challenging, if, for example — assuming we had 10 courts of participants — 40 people play pickleball for 24 consecutive hours. Now that would be a challenge! Crunching Numbers — How Many Steps Could We Do in 24 Hours? That individual challenge aspect brought up some intriguing questions. For instance, if one were to play pickleball for 24 straight hours, how many steps would you likely track on your Fitbit or wearable? 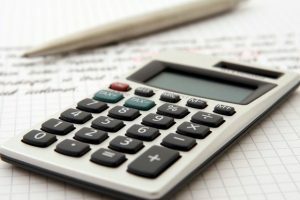 So with pen and paper in hand, I crunched some numbers. Here’s what I figured. When I play “competitively,” I get approximately 1,250 steps per game. Each game to 11 points takes roughly 15-minutes to play. That equates to 4 games and 5,000 steps per hour — which simply means if I was actually playing for 20 of the 24 hours (4 hours for a bit of rest, food and hydration) I would amass 100,000 steps while playing 80 games! Crunching numbers is one thing. Actually doing it is another. While certainly not easy — it does sound doable. Afterall, many of you likely already play for 3-4 hours straight… On the other hand, after playing for 4 hours, you would barely have make a dent in the 100,000 step goal. 100,000 Steps for a Marathon. So How Does that Compare to a Traditional Round-Robin Format Tournament? In late September, I played in a pickleball tournament in Ashland, Kentucky. Our round-robin games began at 11AM. I “warmed up” with my partner beginning at about 9:30AM by playing some skinny singles. We played a few games to 11. He and I then challenged another team to some “friendly” pre-tourney warm-up games. We played a couple of more games. Shortly after 11AM, the “real” tournament games began. Throughout the afternoon and early evening we played 7 round-robin games to 11 points and then did bracket play (including a consolation bracket) after that. On that particular day, I had 31,844 steps — less than one-third of what it takes to hit the magical number of 100,000 steps. Fitbit Success Stories — 100,000 Steps in a Day! 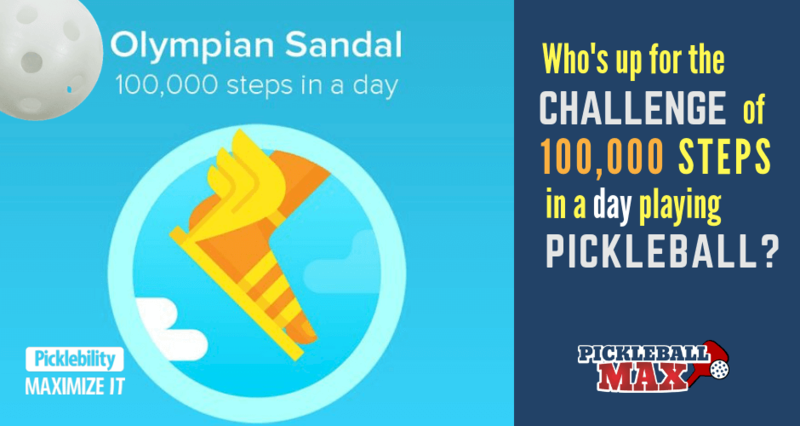 Anticipating the sheer challenge of 100,000 steps, I went to the Fitbit blog to see if anyone has ever, indeed, logged 100,000 steps with their Fitbit and gotten the prestigious Olympian Sandal badge — the badge earned for 100,000 steps in a day. Sure enough. After a quick search, I found a blog post about exactly this — one that chronicled the story of three users who achieved the 100,000 daily step milestone. Similarly, I searched for Fitbit users who attempted 100,000 steps in a day but fell short. There were plenty of those stories, too. None of the stories, however, used pickleball to amass the steps. It’s your Turn! Plan and Prepare for the Challenge, Baby! So are you up to the challenge? Perhaps you, too, can be profiled on the Fitbit blog. Remember, this is a very difficult and physically demanding challenge. It will surely test your limits. Many have attempted 100,000 steps in a day only to come up well short. Please consult a doctor/physician before undertaking this challenge. Once you’ve been given the “okay” to attempt this feat, pick a date such that you have ample time to train and prepare. Also, pick a date in which the weather will likely not play a significant factor. During the event (and several hours prior), please make sure you are appropriately hydrating (and adding electrolytes). You’ll want to have a water bottle — such as a Hydro Flask — with you at all times to keep the water cold and refreshing. Since you’ll be on your feet all day, proper footwear will be of utmost importance for this event. Make sure you have comfortable shoes that allow you to move laterally as well as forward and backwards. Finally, don’t forget your Fitbit to track your steps — and, of course, make sure it is fully charged on the day of the event. Training for a 100,000 step pickleball marathon is critical. You will definitely want to track and record your goals and progress as your prepare for the big day. A pickleball planner may be just the tool you need to keep you inspired and motivated. Use the pickleball planner to record your goals, necessary action steps and daily and weekly progress as you prepare for this challenge. We Want to Hear from You… With Proof!!! See you on the courts! Happy stepping!! !